So, we're gonna go out on a limb here and guess that when your baby came home for the first time, they arrived from a maternity ward, and not a secret WWII Laboratory. No matter! The typical experience doesn't preclude them a heroic future, and we're certain your kid's most certainly atypical. They are, after all, destined to be a real American superhero! Yes, we're just sure they're going to be the next Captain America, and even if they don't have the genetic enhancements of Steve Rodgers, they can still suit up just like him, and start practicing to save the day. As long as they look like a hero! That, in fact, will be easy to do. All we've got to do is get them suited up in this Infant Captain America Costume! 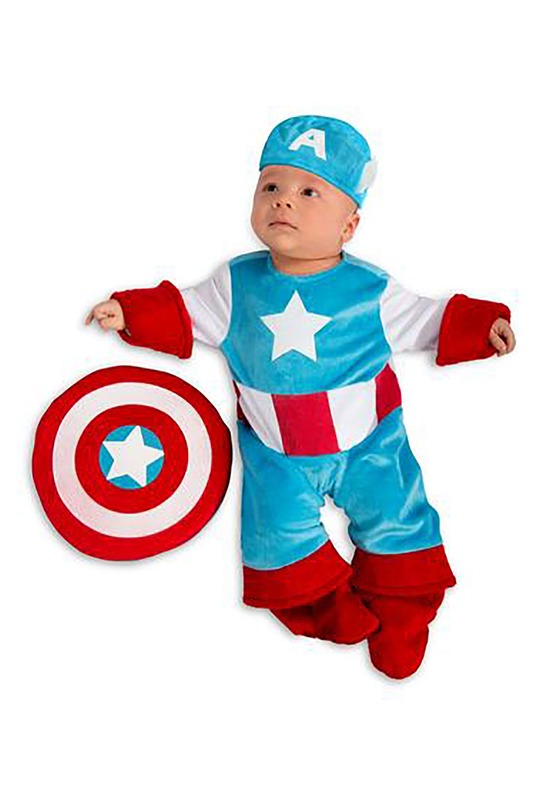 This Infant Captain America Costume is Marvel Comics officially licensed from our friends at Princess Paradise. It has all the styling cues of the classic Captain America uniform, styled as an easy infant romper. It's made of fleece and is soft and cozy, and it has a star logo right on the chest. The headpiece has the Captain America A on the front and tiny little wings on the side. Finally, this costume comes with a little plush shield. The perfect accessory to tie the whole ensemble together! Before you know it, your kiddo will be battling villains and teaming up with the Avengers to save the day. All while being big, tall, and strong, and throwing around his vibranium shield! But, for now, we'll just have to settle for a plush shield. He might not have much strength for battling baddies, but patience is a good thing here. We'll just start him out with practicing this Halloween!